Jaggery also known as Gur in Hindi is a substitute of white sugar and is very healthy food. Jaggery is a wonderful sweetness that not only tastes delicious but also purifies the blood. It acts as a cleansing agent for our blood and purifies it. You simply have to add it to your diet and have its benefits. 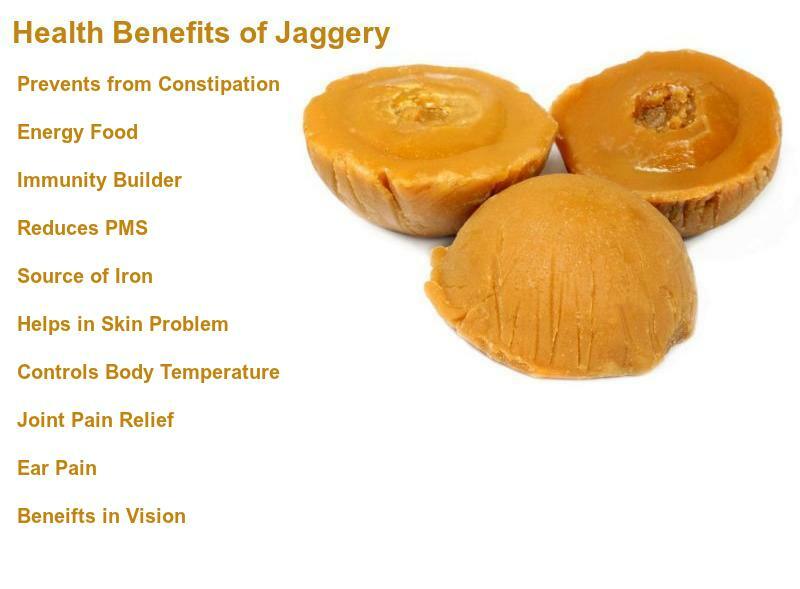 Let’s see amazing health benefits of Jaggery. Jaggery Meaning: A coarse dark brown sugar made in India by evaporation of the sap of palm trees. Calories in Jaggery: Jaggery contains about 98% carbohydrates and about 97% sugar content. 10 grams jaggery provides 38 calories. It is Indian sweetener manufactured from sugarcane. Jaggery is a more complex form of carbohydrate than plain sugar. When we eat it, it is digested and absorbed gradually and releases energy over an extended period of time. As it has natural cleansing properties. It also helps get rid of digestion problems. If you eat a piece of jaggery every day with water or milk, your body will be free from all toxins. It is loaded with antioxidants and minerals like zinc and selenium, which help prevent free-radical damage and also boost resistance against infections. Having a medium sized piece of jaggery with water every day is wonderful for your body and stomach. Especially during summers, it cools down your stomach and whole body temperature. Eat a small piece of jaggery daily to combat the symptoms of PMS which is caused due to fluctuating levels of hormones in your body, it causes the release of endorphins aka happy hormones. It is the main source of iron. So it is very beneficial for patients with anemia. The intake is very important, especially for women. It removes bad toxins from the blood and skin become fabulous and there is no problem of acne. It controls the temperature of the body. It has anti-allergic ingredients so it is quite beneficial for asthma patients. Take a piece of ginger with it. It will not have a problem of arthritis in the winter. Ear pain can be removed by eating jaggery-ghee mixing. Mixing it in millet porridge and eat. Your vision increases.